Derrick Piens and Scott Everingham are professional young artists and former natives of Chatham. They will be exhibiting together in an exhibition entitled Truth and Fantasy. The exhibition opens at the Thames Art Gallery on January 13, 2012, and an artist reception will be held on January 21, 2012 @ 8pm – the artists will be present and live music and snacks will be provided. 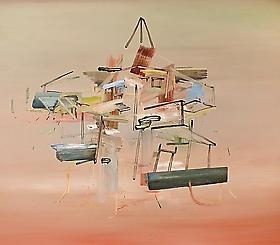 The formal elements of Everingham's paintings are inherent: colour, composition, and balance; it is the impulsive mark-making that builds and defines a particular scenario and location into a living, breathing moment. Influenced by fiction, film, and spontaneity, his work extends to both the abstract and the representational, where the animate language of paint lends life to what may be experienced as very real and new places. Piens received his MFA from Southern Methodist University (Dallas, TX), and BFA from NSCAD University (Halifax, NS). His sculptures are included in permanent collections at The Dallas Contemporary (Dallas, TX), and Meadows School of the Arts (Dallas, TX). Derrick's work has additionally been acquired by several private collections in England, New York, Montreal, and Toronto. He has received support from the Ontario Arts Council. In 2009 Derrick was a resident artist at the Toronto School of Art. He lives and works in Toronto. Everingham holds an MFA from the University of (Kitchener, Waterloo) and a BFA from NSCAD University in (Halifax, NS), and was a semi-finalist in the 11th and 12th RBC Painting Competitions. He recently won a Canada Council for the Arts Project Grant, and had his work Dear Life purchased by the Canada Council Art Bank. Scott lives and works in Toronto.